Jarrett Walker is an internationally renowned transit network planner currently working in Sydney, Australia as a Principal Consultant with McCormick Rankin Cagney. At his professional blog Human Transit (a must-read), he has written dozens of articles about Los Angeles for a global audience, including one titled Los Angeles: The Next Great Transit Metropolis? During his recent trip to California, I had the opportunity to talk at length with Jarrett and he kindly offered to do an interview about Los Angeles for Los Angeles. Since the interview is somewhat extensive, I broke it into two parts. This is Part 1 of our interview; Part 2 is available here. Walker believes the development of the Rapid bus by Metro was a great idea--but thinks it needs to continue to be refined and branded. CR: Compared to other places where you have done transit network consulting, what makes greater Los Angeles unique in terms of its challenges and opportunities for improving its public transportation network? JW: You have tremendous opportunities in Los Angeles because you have a population that’s eager to see public transit succeed, and leadership that understands that only public transit can provide comprehensive alternatives to traffic congestion. The challenge now is to take the enthusiasm that went into Measure R and direct it toward other kinds of political investment. We know that voters will raise their taxes to fund a long-term rail plan. Now we have to ask for another kind of commitment: the apportionment of scarce space on your streets. The streets won’t get any wider, so what’s the fairest way to use them? Street width is the new currency. A few years ago I had a memorable ride on the Ventura Blvd Metro Rapid from Warner Center to Sherman Oaks. The service flowed smoothly through Tarzana and Encino but then got stuck in two miles of gridlock leading up to I-405, as it often does, and the crowded bus spent 20 minutes going almost nowhere. It made no sense. Cars can only fit onto 405 at a certain rate, especially if they’re going over Sepulveda Pass. So in the current arrangement, the surplus traffic is stored blocking Ventura Blvd. Why do you give over the entire width of Ventura Blvd, and effectively shut down the street, just for the purpose of storing waiting cars? Why don’t you set aside a through lane for transit (and perhaps also for taxis, HOVs, and certainly for emergency vehicles) so that efficient use of the street can continue even as the cars pile up? What would be the effect on traffic? Simple: the pile of stored cars would be narrower and longer. But meanwhile, people could get where they were going, and emergency vehicles could get through to save lives and property. Chokepoints in a network are huge opportunities for transit, but only if transit can get past them. This bit of Ventura Blvd is one example. Another is the Sepulveda Pass itself. Metro is widening the freeway to add HOV lanes, which will finally give buses a clear path around gridlock, so that from the Valley to Westwood they can start offering the only truly reliable means of getting through the Pass. If it works reliably you may see a range of services extended through the Pass to broaden the reach of that advantage. But Los Angeles is almost done widening roadways. It’s time to make hard choices about how to apportion the space that you have. The great boulevards of Los Angeles can be, in their own way, as magnificent as the boulevards of Paris. In the last decade Paris has added bus lanes on virtually every one of its boulevards, mostly at the expense of traffic lanes. Traffic isn’t any worse than it was, because once people see that transit is getting through reliably, some of them choose to use it. CR: Los Angeles has somewhat of a unique geography. Instead of having one central downtown, like say New York or Chicago, LA has a number of activity centers, from Westwood to Warner Center to Burbank to LAX. How can public transit effectively serve all these disparate areas? How would you design a network to serve this kind of city? What would be some of its key features? JW: While a lot of effort has gone into downtown Los Angeles in the last few decades, LA is still a constellation of many dense centers, and that is one of its great strengths. Sometimes you hear people say that the key to great transit is to have a single, dense downtown that everyone’s commuting to, like Manhattan or Chicago’s Loop. Actually, that’s a recipe for very inefficient transit, lots of trains and buses flowing full one direction, but then flowing almost empty the other direction. As a constellation of centers, Los Angeles has many corridors where demand flows both directions all day. That’s what makes Wilshire such a superb rapid transit market: it isn’t a big destination at one end and residences at the other, like Chicago. It’s lots of destinations and lots of residents all along the way. That means people are going both ways all the time, so the trains and buses can be full both directions, not just one. Many of the great transit corridors of Los Angeles have that feature to some degree. But that means, too, that in Los Angeles people are going from everywhere to everywhere, and you can’t run a direct transit line from everywhere to everywhere. It’s been tried. It’s still being tried in Sydney, Australia, for example, and it’s a mess. Hundreds of bus routes overlapping each other, each doing something slightly different, most of them not frequent enough to be worth waiting for. The Los Angeles RTD of 30 years ago was more like that, but Metro has done great work in simplifying the system over the years. So connections are absolutely crucial. You have to be able to get off one bus or train and onto another. That has to be attractive. It has to be normal. Fare penalties for transferring, for example, are a problem. The cost of a trip from A to B should be based on where A and B are, not on whether you have to change at C to get there. Metro’s fare penalties have historical and legal explanations, but that doesn’t mean they make sense for the future. There’s a need to rethink that, in the context of your smartcard system, so that the fare system serves the same strategy that the network design is serving. Right now, the two seem headed in different directions. CR: In several posts on Human Transit, you’ve discussed the Metro Rapid Bus network, describing it as the best service that could have been implemented city-wide, given time and resource constraints. Yet, to this day, only the initial lines on Ventura Blvd. and Wilshire Blvd. have received the “full treatment,” (i.e. shelters, information signage, etc.) leading some to see the project as having failed to live up to its billing. 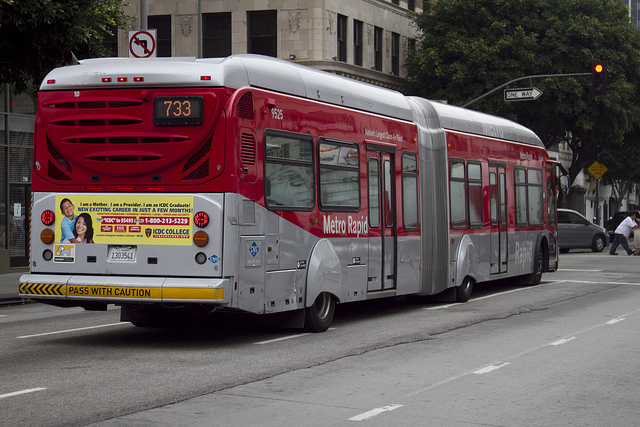 Going forward, what needs to happen to fully realize the promise of the Rapid Bus system? What initial compromises should be reexamined? JW: The Metro Rapid brand followed a predictable arc that you see with a lot of great ideas. First you do a demonstration project in the strongest possible market – which for the Rapid was Wilshire and Ventura. So it succeeds. Now, everybody wants one. So you start replicating it in lots of corridors. But you started with the strongest markets of all, so as you expand it to other markets the payoff diminishes, just as you would expect. Eventually, you hit a downturn and you start cutting them back. Notice how the DASH shuttles went through exactly the same arc: First, a huge success downtown, where the market is ideal for them. Then every neighborhood wanted one. So now you have them all over the city, but of course most of them don’t perform like downtown’s, so you end up running less frequency, and gradually the brand loses some of its meaning. This arc is so common that there’s no point complaining about it. It’s just what happens to great new ideas. So as you expanded the Rapid, a lot of the features that were so cool in the original version just couldn’t be afforded. I’m sure the debates came down to questions like this: Should we extend this great mobility product to just two corridors so we can afford all these cool shelters and signs? Or should we forget about the shelters and just extend this great product everywhere we can? I think the Metro Rapid was a great achievement. The same idea is spreading all over North America now, and I’ve done my best to promote it overseas, citing Los Angeles as the most fully developed model. Even some European cities can learn from it. But it does take some fortitude to protect the meaning of the brand in the face of both financial limits and the demand that every new idea be extended everywhere. It’s good to see some of the weakest Rapids being eliminated, so that the brand can be focused where it will succeed, because that helps you maintain the entire Metro Rapid brand at a higher standard of service and amenity. It’s not so good to see some Rapids being cut to weekday only, or to see frequencies and service duration cut back, because that means that the Metro Rapid brand means less, and that’s bad for all of the Rapids and for the whole strategy that they serve.